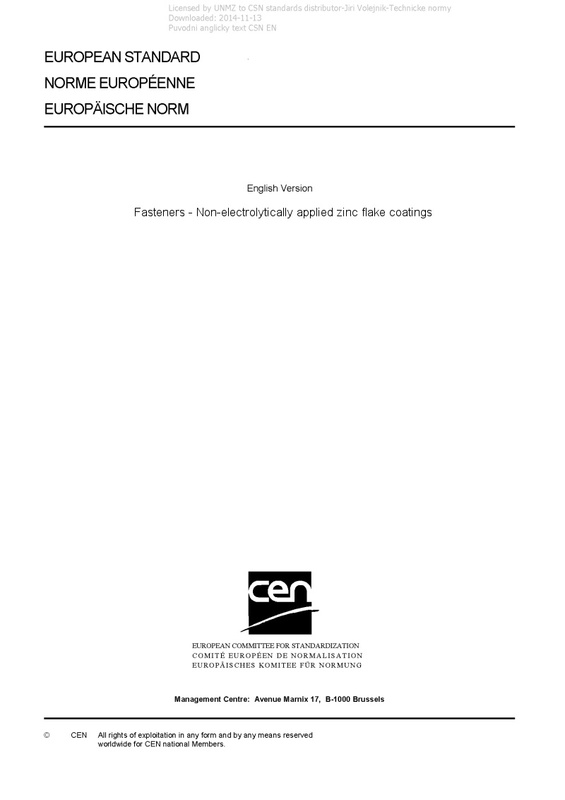 EN ISO 10683 Fasteners - Non-electrolytically applied zinc flake coatings - This document specifies requirements for non-electrolytically applied zinc flake coating systems for steel fasteners. It is applicable to coatings: — with or without hexavalent chromium; — with or without top coat; — with or without lubricant (integral lubricant and/or subsequently added lubricant). It is applicable to bolts, screws, studs and nuts with ISO metric thread, to fasteners with non-ISO metric thread, and to non-threaded fasteners such as washers, pins, clips, etc. This document does not specify requirements for such fastener properties as weldability or paintability. It is not applicable to mechanically applied zinc coatings. NOTE Coatings in accordance with this document are especially used for high strength fasteners (? 1 000 MPa) to avoid risk of internal hydrogen embrittlement (IHE — see 4.4). Information for design and assembly of coated fasteners is given in Annex A.